In order to offer quality training, VB Beach will not offer refunds or make-ups for missed sessions. In the event of a rainout, we will offer a makeup session on the earliest possible day that is available. where you can earn a bid and free entry to the Regional Championships. LOCATED AT FAU BEACH COURTS BETWEEN THE THE TRACK AND SOFTBALL FIELD. PARK IN LOT 12 BEHIND THE SOFTBALL FIELD. WHERE DO I FIT ON THE SAND??? To participate in an ADVANCED small group session player must have experience in SAND VOLLEYBALL. Player is able to serve in consistently, understands positional responsibility of 2 player team, strong skill set. Player is comfortable with blocking/pulling and/or playing defense behind a blocker. To participate in an INTERMEDIATE small group session player has some experience in SAND VOLLEYBALL or player has a high level of indoor experience. Player can serve overhand, pass, serve receive, set and spike. To participate in a BEGINNER small group session player has to want to learn how to play, come with a work hard and ready to learn attitude. Player may or may not have sand or indoor experience. This is also where a majority of our 12 & under will continue to improve their skills such as serving, spiking, passing and setting. 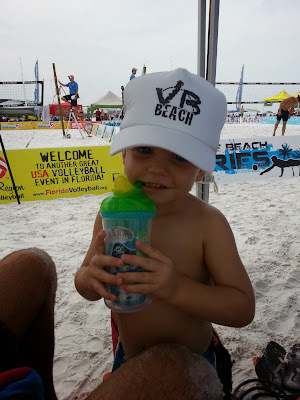 -If you are not sure, send us an email (play@vbbeach.com) and we will be happy to help you find the appropriate session.